Cell Fractionation Kits | BioVision, Inc.
BioVision offers a comprehensive selection of Fraction-PREPTM systems for convenient fractionation of cellular compartments. These kits provide unique formulations of buffers and reagents for convenient preparation of highly enriched cellular fractions from mammalian cells and tissues. The prepared protein fractions are suitable for downstream assays, such as two-dimentional gel, protein immunoblotting, gel-shift assay, enzyme activity assays, reporter assays, and more. Mitochondria/Cytosol Fractionation Kit: Separate highly enriched mitochondria from cytosol of mammalian cells. Simple procedure with no ultracentrifugations or toxic chemicals involved. Mitochondrial DNA Isolation Kit is also available. Nuclear/Cytosol Fractionation Kit: Separate nucleus from cytoplasm in less than 90 minutes. The kit provides a system that maintains the nuclear and cytosol compartments separated. The separated fractions are suitable for downstream assays. Membrane Protein Extraction Kit: Isolate integral membrane and/or plasma membrane proteins efficiently from cultured mammalian cells. The isolated membrane proteins can directly be used in downstream assays. Cytosol/Particulate Rapid Separation Kit: Separate cytosol and particulate fractions so rapidly, even before the small molecules begin to diffuse. The rapid procedure provides unique tools for tracing and localizing both small and large molecules in separated fractions. Mammalian Cell Extraction Kit: Extract mammalian proteins from tissues and cells under nondenaturing conditions. Cell extracts can be used in a variety of assays, such as enzyme activity assays, Western blot, and others. 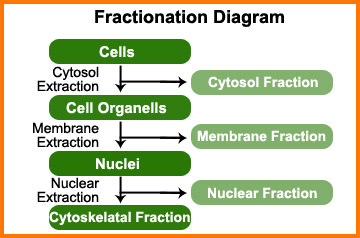 Fraction-PrepTM Cell Fractionation System: The Fraction-PREPTM Cell Fractionation System is designed to fractionate cellular proteins into four distinct protein fractions: Cytosolic fraction, membrane fraction, nuclear fraction, and cytoskeletal fraction. All four protein fractions can be directly used in downstream assays, such as 2-D gel, Western blot, gel-shift assay, translocation, enzyme activity assays, and reporter assays, etc.